Mea Vita: Carpe Diem: Is Social Media Really New? After the spectacular LinkedIn IPO a lot of people have been asking if this social media company is really worth almost $8 billion or could this be another bubble? For that matter, what, exactly, is social media? While participating in a strategic planning meeting, recently, I was asked, "What will communications look like in 2020?" After some thought, my answer was, "social media." Social communications, just like mass communications, has been around since the dawn of civilization, however, the media used to convey social communications is very new. Mass media (the medium, not the industry) began with the printing press which was invented in the 1400s. As a result of technological advances, mass media exploded in the first half of the Twentieth Century with radio and T.V. and it continued growing with the adoption of the Internet. 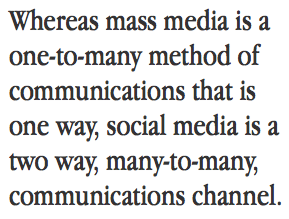 Social media, however, is truly a new media. Whereas mass media is a one-to-many method of communications that is one way, social media is a two way, many-to-many, communications channel. Social media, like many new, unexpected, forms of communication, was first looked upon with skepticism. We saw skepticism like this in the mid 1990s as cell phones became popular. The first few times I noticed people talking on cell phones in public, even when polite etiquette was followed, my reaction was, "What's so important that you have to talk now?" Yet, today, talking on a cell phone in public is not a big deal. However, in the case of new media, many still have the same reaction when everyday-people blog, tweet, and use Facebook on a daily basis. Why does someone need to "tell the world" what they're doing when it's as mundane as, "My cat just rolled over?" In the case of social media, this could easily lead to a conversation between cat lovers who didn't know each other. Everyone enjoys spending some time engaging likeminded people. Social media simply extends the social conversations that we have at the water cooler, on the phone, or during dinner, and moves them into cyberspace. While specific media and technologies may come and go, such as the 8-track, telegram, or the fax; other, more fundamental forms of communication are here to stay. However, new forms of media do not quickly replace the old ones any more than the telephone has replaced radio communications, or that e-mail has replaced "snail mail".